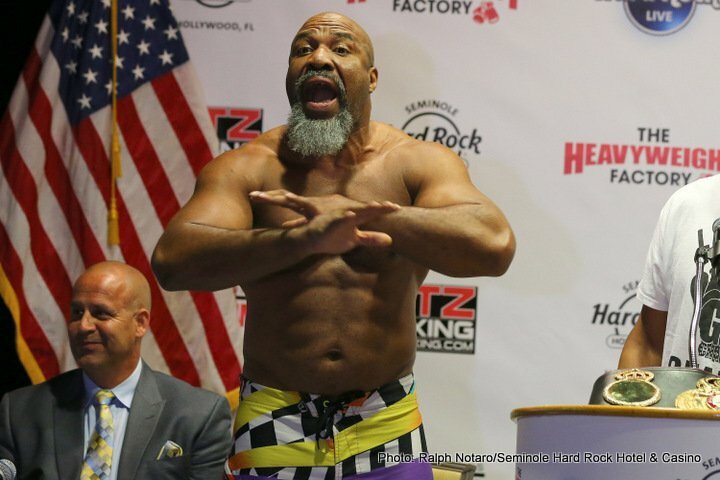 “It’s gone get messy,” Shannon Briggs. There will be no less than three heavyweight champions, past, present and maybe future on hand in Belfast, Northern Ireland this Saturday night. Tyson Fury, who has to take care of business against Francesco Pianeta in what is his second comeback fight, will be watched, and later no doubt heckled, by reigning WBC heavyweight champ Deontay Wilder and former lineal and WBO ruler Shannon Briggs. Rest assured, Fury will be more than up for the heckling, set to give as good, or better, right back. Wilder will be in Belfast in an official capacity, set to conduct commentary duties for the Fury-Pianeta fight for Showtime – along with the main event, the Carl Frampton-Luke Jackson fight; an important interim title fight that, despite being the official headliner, has pretty much got lost in the shuffle, what with all the talk about the big men of the sport and what may happen when their combined 450 pounds or so occupies the same space. But Briggs – who has posted his flight schedule on social media, letting us know he will be in town this weekend – will be pretty much an uninvited guest. What mayhem has gatecrasher Briggs got in mind? Wilder is likely to enter the ring and go nose-to-nose with Fury (and Fury will almost certainly enjoy this) as the two further hype up there possible/probable November/December fight (a fight that really does not need any further hype). But will Briggs, who is still chasing a big fight and with it a return to relevance, be permitted to get into the ring as well? Will the ring be able to take it if all three giants get in there and take part in some sort of bizarre Royal Rumble! It could be pretty entertaining for the fans, but let’s hope things don’t get too far out of hand. Briggs, inactive since May of 2016 and who tested positive for an illegal substance since then, is chasing a fight with Fury the way he unsuccessfully went to quite extreme lengths to push and shove his way into a big fight (big-money) with Wladimir Klitschko and then David Haye. Might Fury, if he feels he needs one more “tune-up” before tackling Bronze Bomber Wilder, accommodate Briggs in, say early or late October? Would Briggs be able to get a license to box in the UK again? Briggs is clearly hoping his presence in Belfast will lead to something, and just maybe it will be that chance to take away Fury’s unbeaten record. While that result would be great for the fun-loving Brooklyn veteran, it would be a cruel, and quite ironic blow to all the fight fans in the world who want to see Fury face Wilder. Briggs has crashed many a party, might he now get his chance to spoil a massive one? I can see it now: Fury beats Pianeta with ease, feels he needs more work before tangling with Wilder, faces Briggs, survives a wobble/scare and then gets it on with Wilder before the year is out. Everybody is happy, right? Well, maybe. Previous boxing news: Joseph Parker Vs. Lucas Browne: Who Wins The Battle Of New Zealand Vs. Australia?